How often do you have breakfast for dinner? I actually have breakfast for dinner quite often. It’s one of my favorite things to have for dinner to tell you the truth. This kind of “Breakfast After Dark” is not only easy and quick, it is also so delicious and comforting! 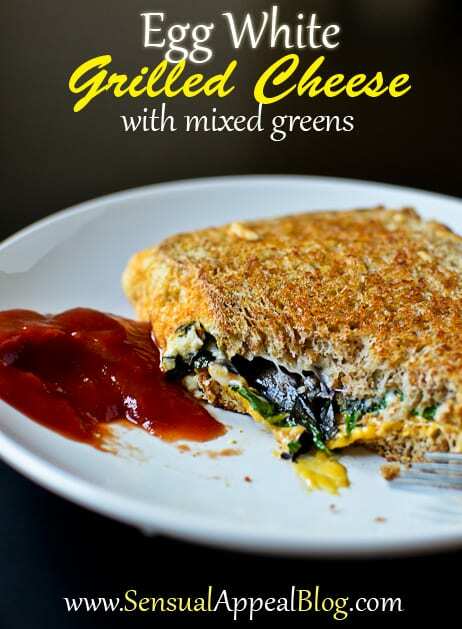 Especially the Egg White Grilled Cheese with Mixed Greens that I created as my Breakfast After Dark recipe that I am sharing with you today. 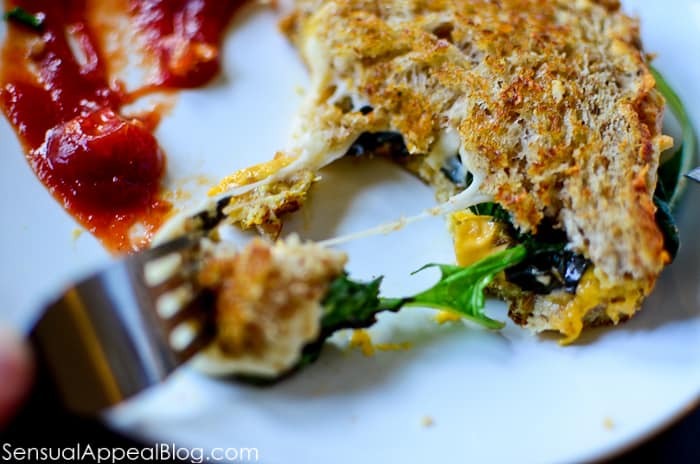 This grilled cheese breakfast recipe is not any random recipe. It is actually something I make for myself as a Breakfast After Dark meal quite often. It is super comforting to me, I’m not quite sure why – but it evokes feelings of security, comforting, and just overall happiness. The melty cheese, the warm protein-filled egg whites, the gorgeous color of mixed greens… the tart contrast of ketchup on the side. It’s an overall perfect meal to have at night. I’m very happy to be sharing this with you today! It’s so simple to make, I actually debated whether I should even post it. But then I thought “Not everyone makes the same exact breakfast for dinner meals” and when my roommate saw me making this last night, she was actually surprised and confused as to what I was doing. She has never heard of making an Egg Battered Grilled Cheese. 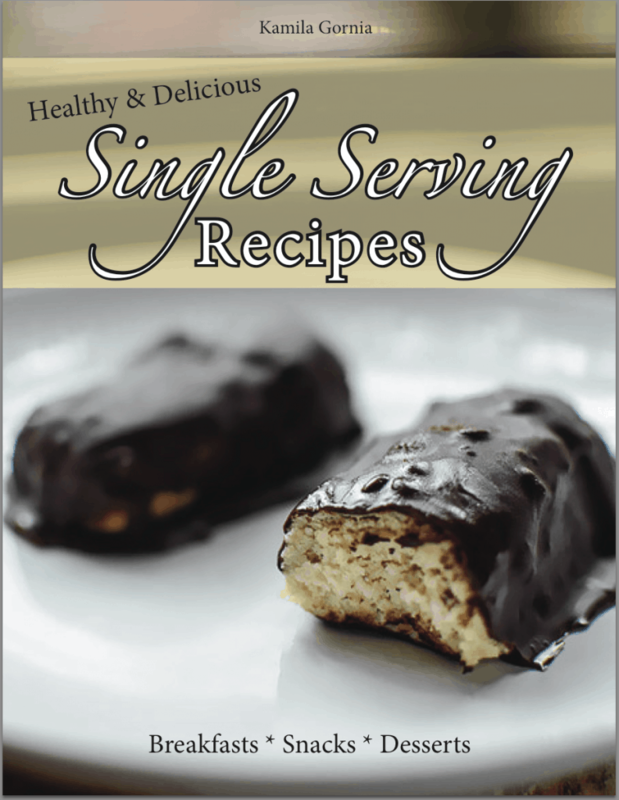 I was stunned and that’s when I knew I had to share this simple recipe with you all! 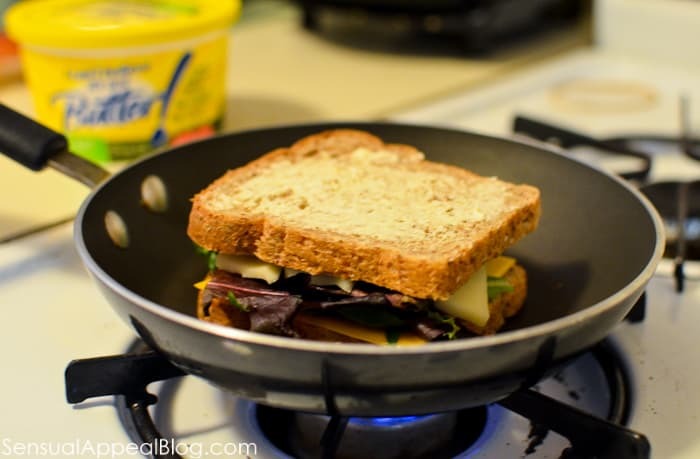 First, you take two slices of sprouted grain bread and put some buttery spread on one side of each slice. I used the wonderful I Can’t Believe It’s Not Butter Light Olive Oil spread. I’m surprised I haven’t used this before! 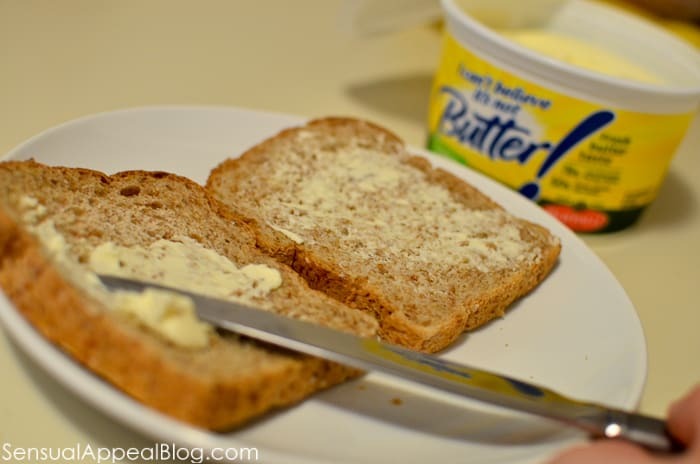 It works and tastes JUST like butter but has 70% less saturated fat than butter, no hydrogenated oils and is made from a blend of vegetable oils. The only reason I never bought butter before was because of the saturated fats so I’m totally going to start buying this more often. 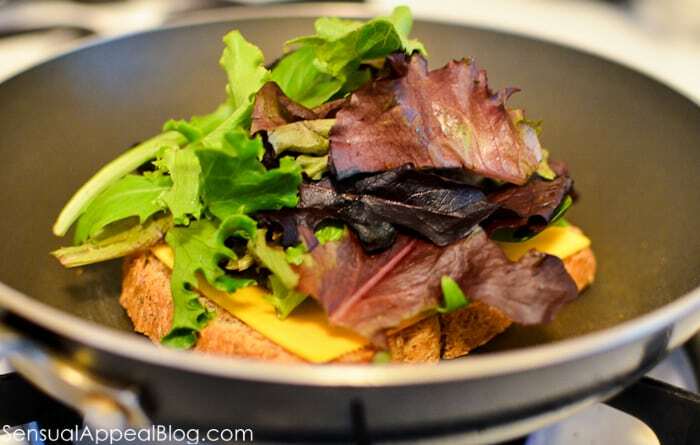 A grilled cheese simply does NOT work as well if you use oil. There is no comparison. 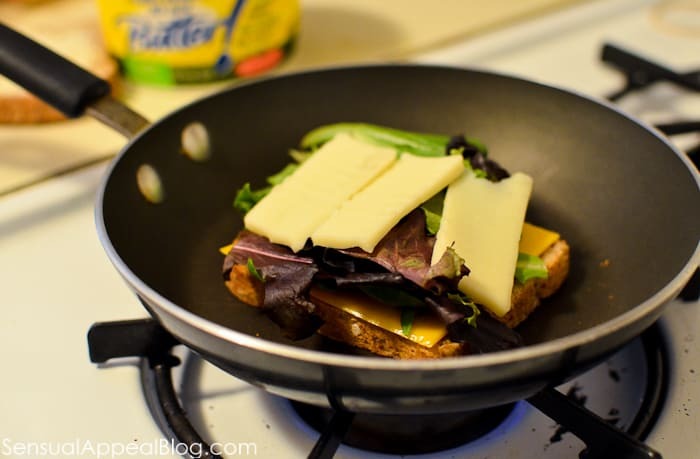 Put a slice of American Cheese on the bread. The buttered side is down on the slightly buttered pan. 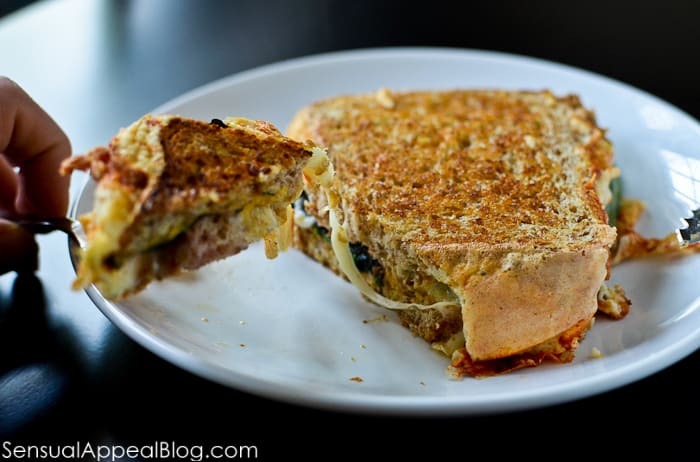 To mix it up, the second topping of cheese is mozzarella – my favorite. Put the second slice on top and press down. 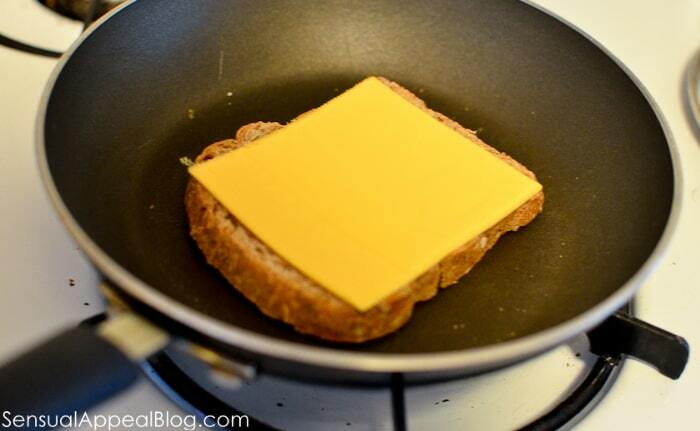 If the bottom of the grilled cheese is already browned, you can flip the grilled cheese on the other side to brown. 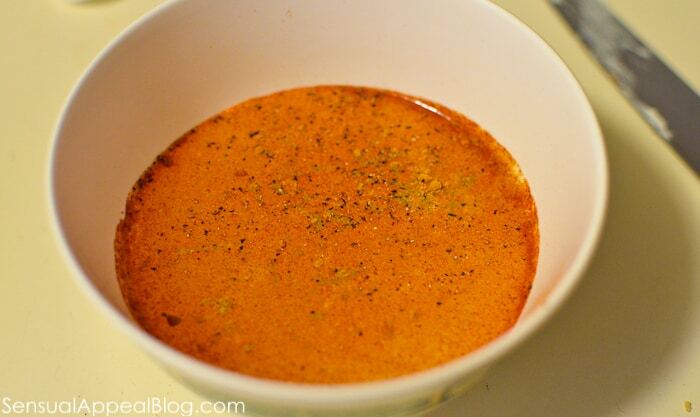 In a small bowl, add liquid egg whites with spices for that extra kick and mix to combine. 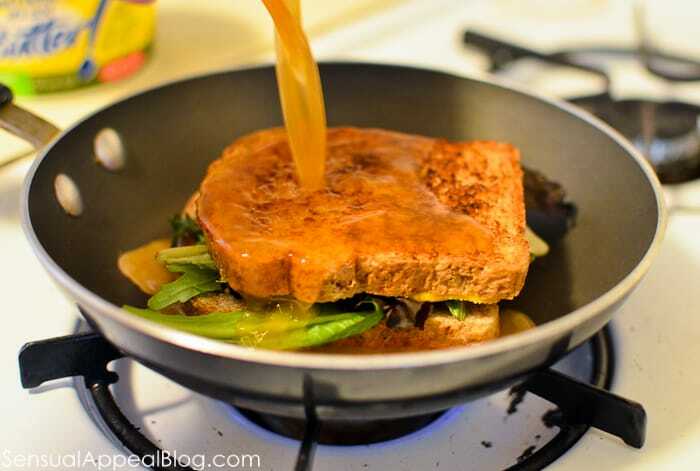 Pour the egg white mixture on the browned side of the grilled cheese and let it cook nicely. Ahhhh, so close – I am excited for this! Mmmm there it is. That’s it. The melty cheese. 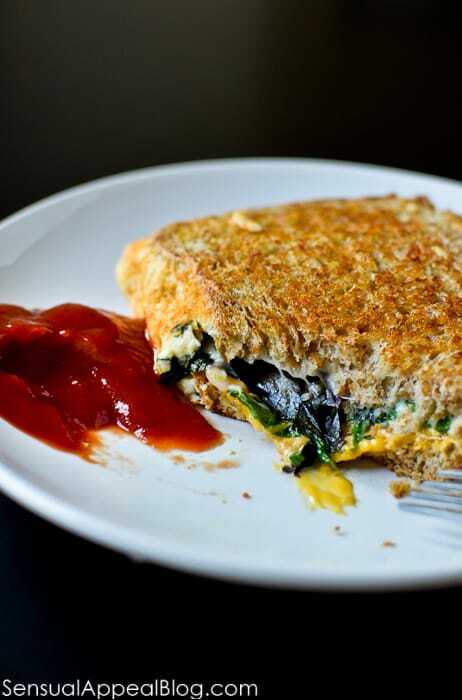 Delicious Egg White battered Grilled Cheese sandwich with mixed greens. What could be better? Oh I know. A nice addition of ketchup on the side is perfect to this. I’m so Polish. We love ketchup. I was originally going to make my own version a frittata, similar to the one posted on Breakfast After Dark websides, but I thought – since I’m only making this for one person, it’s hard for me to always finish a bigger dish because I prefer to eat things fresh rather than as leftovers. So that’s why I created my own Breakfast After Dark recipe 🙂 And I didn’t look back! How often do you make Breakfast for Dinner? What’s your favorite meal to have for Breakfast for Dinner? We’d have breakfast for dinner about once a month in the dining hall my first two years of college, and I HATED it. I don’t know why, because I loooooove breakfast food, but for some reason I just could not get on board with breakfast food after like 11 a.m., probably because I tend to go sweet rather than savory for breakfast and savory rather than sweet for dinner. I still pretty much never make breakfast for dinner, though this sounds like something I could get on board with. Coating it in egg makes me think of French toast, but the end result looks much more savory than your standard French toast. I like it! That is one good looking egg sandwich! I like having eggs for dinner! Matter in fact I think I just might make an egg sandwich for dinner! Thank you for sharing! What a wonderful breakfast sandwich idea! Do you happen to know if ICBINB has whey (or dairy) in it? I’ve been looking for another butter alternative as I have to drive out of my way to get the one I use now. This sounds sooo delicious! My boyfriend and I love doing breakfast for dinner! I’m a firm believer in breakfast for any meal so BFD happens a lot in my house! Favorite breakfast for dinner: EGGS…any way and every way!